After immigrating to Chicago, they spent years imagining a different Egypt. Now the revolt is making them rethink their dream. By Kareem Saleh. After immigrating to Chicago, they spent years imagining a different Egypt. Now the revolt is making them rethink their dream. Plus, full coverage of the uprising in Egypt. The faces of Egypt's revolution are young. They carry cell phones and organize on Twitter. My parents, who left Egypt 30 years ago and had all but given up on their country, are stunned. This is the revolution they never thought would come. "I've lived through three Egyptian wars," my mother told me. "But I've never seen anything like this." My mother watches the protests from a balcony in Alexandria. She flew in from Chicago to take care of my sick grandmother and, like so many others, was caught off-guard by the demonstrations. From her balcony, she sees shopkeepers give water to students and families toss oranges from their windows. Protesters carry the dead through the streets. Neighbors gather to protect my grandmother's home, a 19th-century Italian-style building overlooking the Alexandria Opera House, from the looters swarming the city. Smoke from burning buildings and cars billowed through my grandmother's apartment on the famous Tariq al-Horreya. In anticipation of losing water and electricity, my mother gathered candles and filled the bathtub with water in case she needed to bathe her sick mother. She hears the army roaming through her neighborhood and jokes that they seemed most interested in protecting the Four Seasons Hotel. And yet, she wasn't completely cynical. "There is an irreversible change in the psyche of the nation," she told me when I was finally able to reach her by phone. "The people have the keen sense for the first time that they are mightier than the government—and they can smell the regime's desperation and fear." My parents came to America in the mid-'70s precisely because they felt that reform would never come to Egypt. Moreover, they saw that bad things happened to those who tried. They often tell a story about my uncle Isam, a talented biochemistry professor at a prominent Egyptian university. One day during his office hours, a female student asked him if he would agree to have a specimen studied in his laboratory. Without giving it much thought, my uncle directed a member of his staff to analyze the material. The lab report came back showing the specimen was some kind of rotten meat. My uncle didn't know that the student was the leader of a campus activist group, and the specimen was taken from meat served in the campus cafeteria. Armed with my uncle's laboratory report, the young woman provoked an uproar among students. This led to campus sit-ins to protest the corruption of the university administration. To punish my uncle, university officials cut the funding for his research and shuttered his lab. My parents shared this story to make a simple point about life in Egypt: A corrupt system takes an honest man prisoner. The lesson? Make do with the current reality—or leave. My parents immigrated to Chicago and started a medical practice. My father is now at home in Chicago, watching Egypt obsessively on a split-screen TV. On one side Al Jazeera features the demonstrations raging through the streets. On the other, Egyptian state media proclaims that all is calm. Egypt, he says, has reached the point of no return. "People realize that if they stop now, they'll lose everything they've achieved so far. They will stay in the street in spite of the curfew and regardless of the consequences. The army will decide if it will be bloody or not." My father says that he would be out there in the streets, with the students. "They are doing what my generation was unable to do." My parents understand why political repression and economic hardship would lead people to rise up. What's less clear is why it took them so long. Today my mother is unsentimental about Egypt. She returns only periodically, to take care of her family. My father, on the other hand, has always felt sad and guilty about his decision to leave. My father says that if the protesters succeed in unseating Mubarak, he will go back to help rebuild his country. He would try to take what he has learned in America and pass it on to Egyptian medical students. He says he would do it for free. "Thanks to these protestors, maybe I can still do my part," he tells me. I realize that all these years, he had actually been waiting. He thought he might still have a chance to make Egypt a place where we'd want to live. I think now about the many hours my father spent listening to the songs of Oum Kalthoum, preparing foul mudammas and koshary in our Chicago kitchen, and forcing me and my brother to watch the movies of Youssef Chahine. I realize that all these years, he had actually been waiting. He thought he might still have a chance to make Egypt a place where we'd want to live. 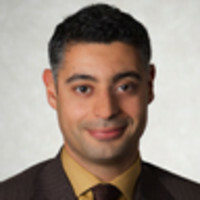 Kareem Saleh is a financial services lawyer and policy entrepreneur. He served on the Obama-Biden campaign and transition team, working on economic policy issues. Previously, as a German Marshall Fund program officer, Kareem oversaw a $5.5 million grant portfolio in the areas of trade and development policy. He is a graduate of Georgetown University Law Center and the University of Chicago, and is a fluent speaker of French and Arabic.